For us, coffee is more than a cash crop; it is a source of pride, and dignity; it is access to education, to health care, and to decent housing. But first and foremost, coffee solidify communities, strengthening links between generations, among gender and across cultures. I live in Cihonga Village, in Ngozi, a northern province of Burundi. I am a coffee grower. Marie-Therese joined Kahawatu in 2013. 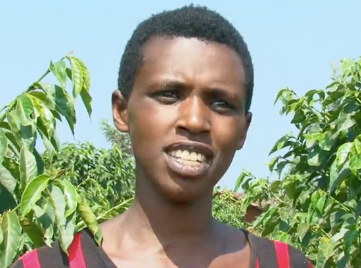 For the last 15 years, her husband owns 600 coffee trees but the family progressively abandoned their coffee plantation; the volume produced and earnings were insignificant. When Marie-Thérèse heard about Kahawatu, she asked her husband for the permission to participate. He agreed and allowed her to manage 100 trees. Marie-Thérèse is attending all trainings and herself, and teaches a group of 30 growers living in her area. She was proud to tell us that her husband now wants to give her more trees. My name is Jean Rwasa. I live on the Gitanga Hill. I am the father of 12. I grow coffee since 1972. Jean Rwasa has joined Kahawatu in August 2013. 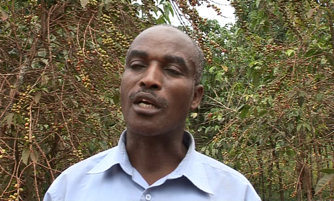 For a few years, Jean has observed that his coffee cherries production has decreased and that his soil depletion was threatening his plantation. By implementing the good agricultural practices taught by Kahawatu and CIRAD, Jean has today almost doubled his production; in 2014 at the end of the first year he joined Kahawatu, his yield was approximately 700kg. In 2015, it was 1800 kg. I live in the Province Ngozi. With the help of Kahawatu, I started Rama Dufatanemunda, "the self-empowered group" counting today more than 120 women. Marie-Annociate is the President of the RAMA DUFATANEMUNDA association (the “self-empowered group”). Kahawatu helped the group's creation and emancipation. The Foundation also enabled the group to diversify food production and sources of revenue. As women in Burundi are not entitled to own land, Kahawatu supported the application process and lobbied for the group to obtain the Provincial authorization to borrow a piece of land to grow coffee. The application process lasted for months. In the meantime, the women's group did not loose time. They started training on modern agricultural practices and created a VSLA. VSLA is a loan group that enable them to help one another by pooling savings and making small loans to those of the group who need it the most. Despite multiple meetings and calls, the decision was finally rendered. The group was not granted the authorization to use the land. Some individuals witnessed Kahawatu's lobbying efforts and were touched by the determination of the group. One of them, ended up giving away his own land rights to Rama Dufatanemunda. Since then, the women of Rama have worked relentlessly to prepared the land, and plant coffee trees. Within two years, these women have established a model plantation with healthy coffee trees, composting plots, and fodder trees. Their first coffee yield is expected in 2017. In addition, Kahawatu gave beans seeds so that the group could to grow them for their families's needs and sell the extra on market. The revenues earned from the vegetables sale were reinvested toward renting more land land to grow potatoes. Furthermore, Kahawatu has introduced a livestock solidarity chain in order for the association to produce organic fertilizer and milk for their families. When she started mobilizing other women, Marie-Annonciate often had to leave her house. Once, someone stole almost their entire crop and her husband got really angry. He blamed her for this incident and he chased her away. After a few weeks, he allowed her to come back. Today, Marie-Annonciate's husband understands the importance of what his wife is doing and believes it will bring good opportunities for the entire family. Marie-Annociate's story demonstrates the limitations faced by Women in Burundi. Kahawatu has therefore organized workshops at each of its partnering coffee washing station to sensitize the communities on the importance of women’s recognition as an equal household member. Thus, all lead farmers and their spouses have been invited to participate in the sessions. Marie-Annonciate is an example of new role model that Kahawatu aims to create via women-led cooperatives.